Junior golf is flourishing at the Okanagan Golf Club. We are now the coaches of three school golf academies: Aberdeen Hall, Okanagan Mission Secondary, and George Elliot Secondary. We also boost as very successful Junior Summer Camp program. We pride ourselves in growing the game and the development of young golfers. We offer a wide variety of options in instruction from 6 year old beginners to University bound competitors. 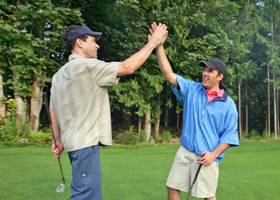 This is great way to learn the game with your friends in a fun and safe environment. Golfers receive 4, one-hour sessions that will be tailored to the group's specific needs and can be arranged with your schedules in mind. Private Coaching will give you a chance to work one-on-one with one of our trained instructors, great for golfers of all abilities. Lessons are 45-minutes in length and will be tailored to your needs. Coaching available for ages 5-18. Our junior golf camps cover all the basics and fundamentals of the golf swing. We also teach the short game basics to become a short game wizard. Time and weather permitting, we cover golf course management on the golf course. After the four days the kids will have a firm understanding of the basics of golf, golf course etiquette, and golf course management. Four-day camps for ages 7-14 years. Do you have a junior that loves the game of golf and is looking to take their game to the next level? The Okanagan Golf Club is the first club in the Okanagan to offer a 12-month high performance junior program. This program is designed for the competitive junior golfer. You will receive private instruction, on course group training session, and fitness, and nutrition with our award winning GBC Academy Instructors. Tournament Support: Our coaches attend many of the major junior tournaments in Canada and the US with their students. A tournament schedule is created based on the Golf Canada junior tournament ranking, for the 2017 season. As a team, we attend MJT, CJGA, BCGA, and Golf Canada events. "PGA of BC Teacher of the Year, 2014"